Annual Seedy Saturday And Green Fair. Learn how to live more sustainably, exchange seeds with other seed savers, buy heirloom and organic seeds or join a workshop on sprouting, soil and composting and more. Then stop by one of our local garden clubs’ tables and ask an expert! This day promises to be fun for everyone. Over 40 tables will include heirloom seed vendors, green exhibits, bee products, worm composting, backyard gardening, garden associations and regional organizations such as LEAF, the TRCA and Rouge Park. Be a steward and bring in your used electronics for recycling! And there will be kids events too. The Fair is hosted by the Stewards of the Earth at St. Agatha Catholic School, the Treehuggers at Blessed Cardinal Newman Catholic High School, and Seeds of Diversity. Our meeting on Thursday, June 4, 7:15 to 8:15pm is at the Albert Campbell Library auditorium (to the left off the downstairs lobby). The library is located at 496 Birchmount Road, just north of Danforth Road. Dusha will be on hand to discuss the great work this organization does to safeguard and improve Toronto’s environment. We are also preparing for the coming federal election, and hope to see a number of our prospective candidates at the meeting. 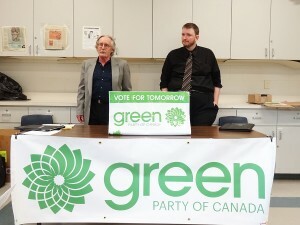 Special Guest : Jim Harris – Well known speaker on Business, Innovation and the Environment, leader of the Green Party of Canada from 2003 to 2006. To be eligible to vote you must be a member and have joined at least 30 days prior to the meeting and live in the riding of Scarborough Southwest. Lapsed members can renew their membership up until the Nomination Meeting. Kindly RSVP to help us organize better. Take either 68A Warden South bus or 68B Warden South via Birchmount from Warden Station, or the 12A, B or C Kingston Road bus from Victoria Park Station. To be eligible to vote you must have been a member at least 30 days prior to the meeting and live in the riding of Scarborough Southwest. * We will start registering voters at 6:25pm and call the meeting to order at 6:35pm. We hope to have our candidate selected by about 7:45pm, and end the meeting shortly thereafter. In the unlikely event that there is another tie vote, we will allow more questions from the membership, and hold a second ballot, in which case the meeting may extend up to 8:15pm.